I once saw tortellini stuffed with bolognese sauce for sale at Trader Joe’s, so I thought that I could surely stuff tortellini with my magnificent meat sauce. And I could! My last experience making ravioli from scratch was very time consuming, so I decided to take a shortcut this time and replace the homemade pasta with wonton wrappers! I had heard good things about using wonton wrappers to make stuffed pasta, and they worked out wonderfully! Once cooked, they had the same qualities that I love about homemade pasta: they were perfectly thin and tender. I’ll be making my tortellini/ravioli this way from now on (for regular noodles, though, I’ll keep the homemade stuff in rotation!). 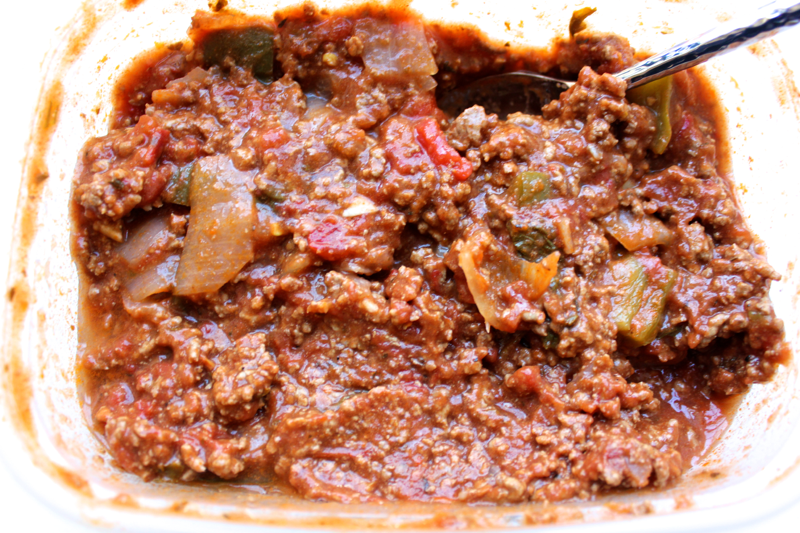 To begin, the meat sauce should be chilled, and its consistency should be on the thicker, meatier side. I found that it’s best to make each tortellini from start to finish so that the wonton wrapper remains pliable and doesn’t dry out, so skip the assembly line approach here. Fill up a small bowl of water. 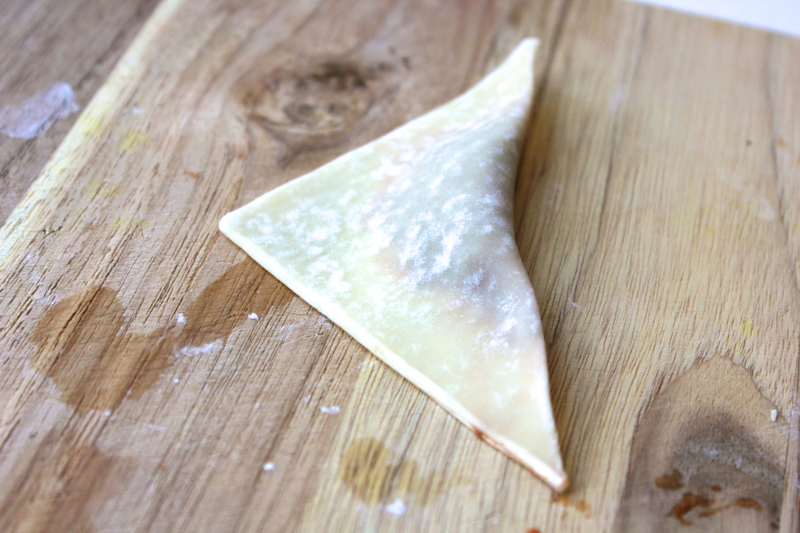 Take out one wonton wrapper, and place it on a flat surface. 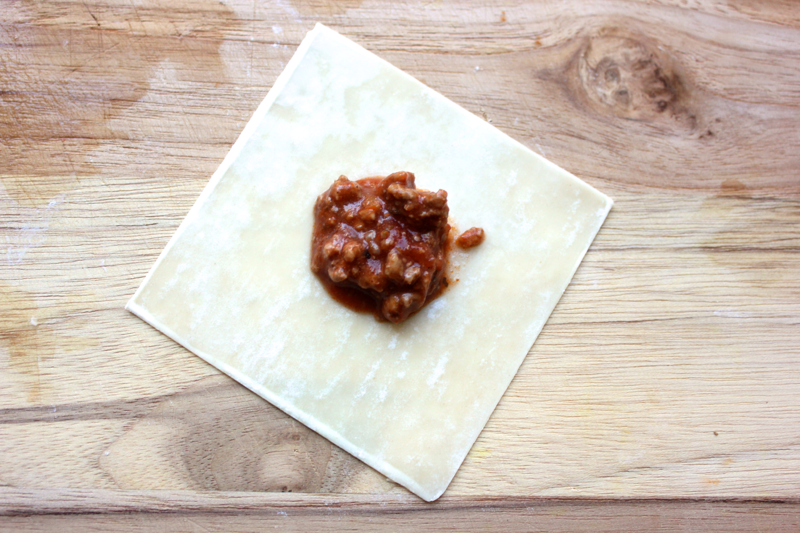 Dot 1 teaspoon (use a measuring spoon) of the meat sauce in the center of the wonton wrapper. 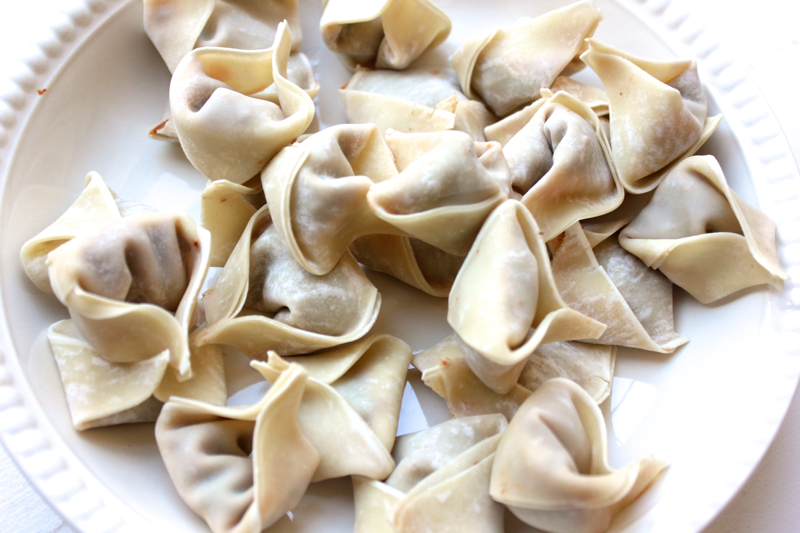 Wet your finger in the bowl of water, and moisten two adjoining edges of the wonton wrapper. Then, fold the wet corner over on a diagonal to cover the meat sauce and meet the dry corner. 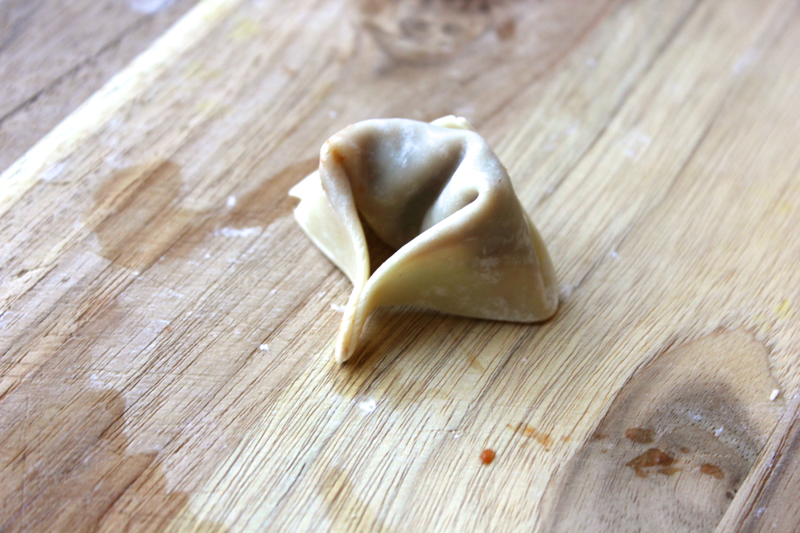 Use your fingers to seal one edge of the wonton wrapper at a time, pressing out any excess air. Feel free to pick the wonton wrapper up to seal it…it doesn’t have to stay on the board. Once you have made a triangle, moisten the top corner of the triangle, and fold it down, sticking it to the bump of encased meat sauce. Then, moisten one of the remaining corners, and fold it over and stick it to the dry corner. Tah dah! You now have a tortellini! 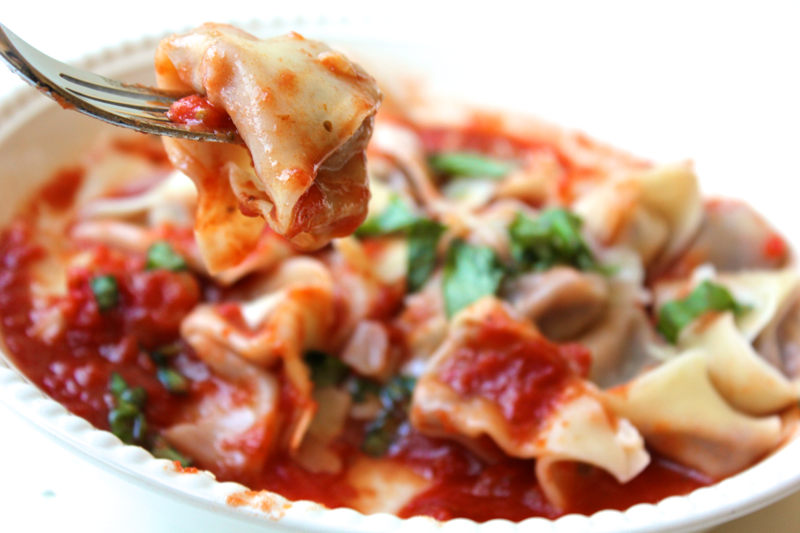 Continue making the rest of your tortellini. Bring a pot of salted water to a boil, and drop in the tortellini. Let them cook for about 3 minutes until the wonton wrappers become noodley and translucent. Drain the tortellini, and toss them with some warm marinara sauce. Don’t toss them in the meat sauce or else you won’t be able to tell that you’re eating something different when you bite into the tortellini. 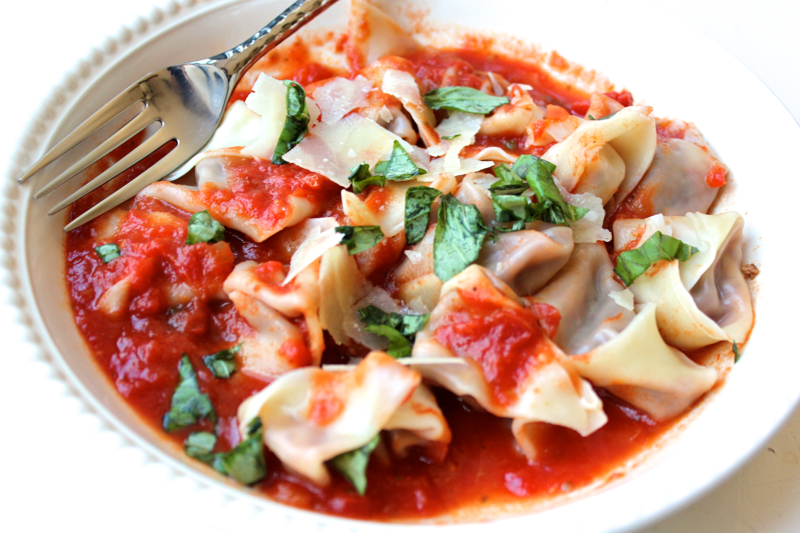 Top the tortellini with minced fresh basil and shaved parmesan cheese. It is so delicious and filling…and impressive! No one will know you took a wonton wrapper shortcut! This recipe sounds so awesome!! I love tortellini’s and you make it sound so easy. I always have won ton wrappers in the house and this is a great idea. thanks for sharing this wonderful recipe with all of us! !